When considering an overseas honeymoon (or even a destination wedding), the venue selection can be rather harrowing with an entire world to consider. As part of our #honeymoonhumpday series, we're going to be bringing you a variety of venue profiles, honeymoon styles and tips every Wednesday to help you narrow your options down to somewhere truly amazing. 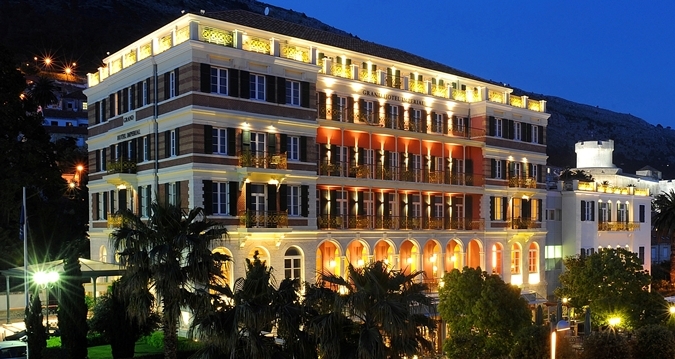 Today's venue is the Hilton Imperial Hotel in Dubrovnik, Croatia. 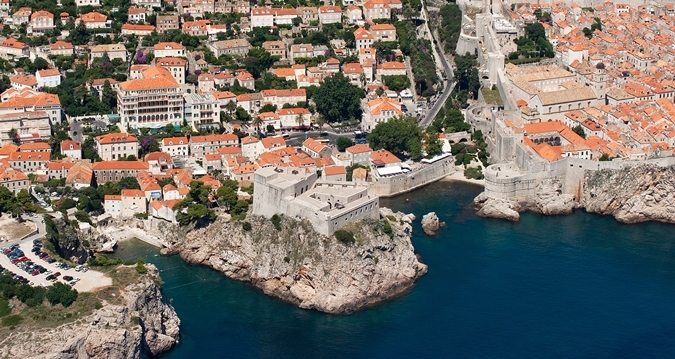 Having stayed here myself, I can attest to the luxury and spectacular location of the Hilton Imperial Dubrovnik. With its ornate golden yellow balconies that look over the main street, the city walls and the fort which stand just metres away through the gates to Old Town Dubrovnik, it is a truly beautiful hotel and what I hadn't realised until a few days after I checked in was that this very hotel was very near entirely destroyed during the war in the 90s, being subjected to a direct hit that destroyed the top floors and lit the rest of the hotel ablaze. The Grand Hotel as it was known then was refurbished into the beautiful Hilton Imperial Dubrovnik you see today and has remained as true to the original as it could be. It was such a truly beautiful place to stay with such an incredible outlook over Old Town Dubrovnik. The hotel itself is truly stunning, but the views are really the drawcard. Request a room that looks out over Old Town and your French doors will be filled with the incredible view of the medieval forts and city walls. As well as the plethora of dining options in the hotel itself, you're afforded a veritable sea of dining options just outside. Restaurants and clubs line the city walls including the amazing Nautilus Restaurant. Inside the city walls you'll find even more options as well as the elusive Buza Bar that takes a bit of effort to locate but the hunt is definitely worth it to take in a drink on the side of the city walls' cliff face right over the water. If you're going to Croatia, we recommend flying into Zagreb and driving down to Dubrovnik to really get to see the country down the coastal motorway, a truly beautiful sight to see.